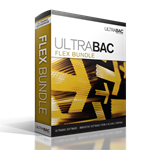 The UltraBac Flex Bundle provides the best all around protection for your business servers. It is a multi-pack of the UltraBac Ultimate Bundle for larger networks. The product combines the standard backups of UltraBac with UBDR Gold disaster recovery to protect 10 servers. This provides quick file-by-file or bare metal restores at your fingertips, along with the ability to perform dissimilar hardware restores and virtual recoveries. Plus, choose any two agents to tailor fit the solution to your needs. For information on how to import a license, request a new license, request volume licensing, and other frequently asked questions, please visit our license assistance section.